The leads for Wolf and Casey over Wagner and Barletta are larger than they were found to have by an August poll. A new poll measured how voters would vote if the midterm elections were today, but it also measured perception of President Trump. NBC10's Lauren Mayk explains. The Democratic incumbents in the top two races on Pennsylvania's ballots in the upcoming November midterm elections, Gov. Tom Wolf and U.S. Sen. Bob Casey, continue to hold commanding, even potentially growing, leads over their Republican challengers, new polling data suggests. Wolf holds a "comfortable lead" over former state Senator Scott Wagner, 52 percent to 30, and Casey leads U.S. Rep. Lou Barletta, 50 percent to 33, according to 545 register voters polled by the Center for Opinion Research at Franklin & Marshall College. Those leads are larger than the last poll publicly released in the two races, a survey of 825 adults conducted Aug. 12-16 by The Marist Poll in partnership with NBC News. In that poll, Wolf lead 54 percent to 40 over Wagner and Casey lead 53 to 38 over Barletta. 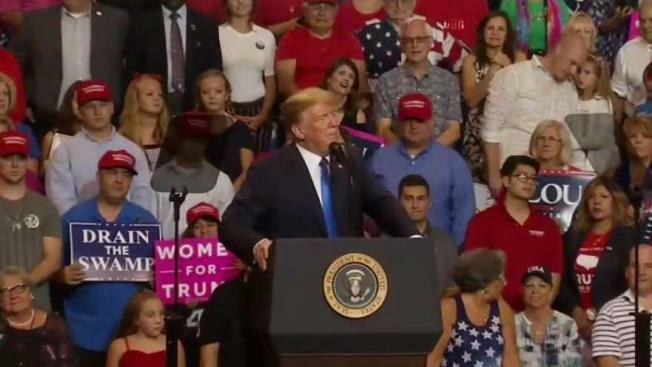 From those races down to the U.S. House contests for Pennsylvania's 18 seats, the poll found that President Donald Trump is casting a large shadow over Republicans' hopes. More registered voters prefer the Democratic candidate to the Republican candidate by a margin of 51 to 36 in the congressional races. And three out of four polled who said they plan to vote for the Democratic candidate on their ballot said they "are casting their ballot mainly as a vote against President Trump and Republicans in Congress," according to the Franklin & Marshall Poll. "The link between congressional choice as support or opposition to the President has intensified since August," according to the poll's findings.